For Iowa Commodity Challenge market simulation instructions and example marketing plans, please click here. 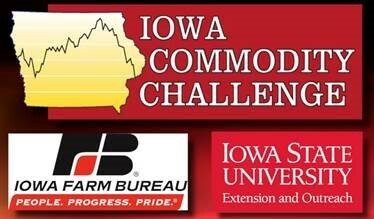 View all videos on the ISU Extension and Outreach Iowa Commodity Challenge Vimeo channel. For the Iowa Commodity Challenge Marketing Tool Workbook, please click here. For the 2019 Estimated Costs of Production, please click here. For the Crop Marketing Matrix (indicates the range of tools that fit different market situations), please click here. For the 2018-19 Iowa Commodity Challenge Weekly Tracking Table and Charts (3/13/19), please click here. Updated: For the 2019 New Crop Iowa Commodity Challenge Weekly Tracking Table and Charts (4/17/19), please click here.